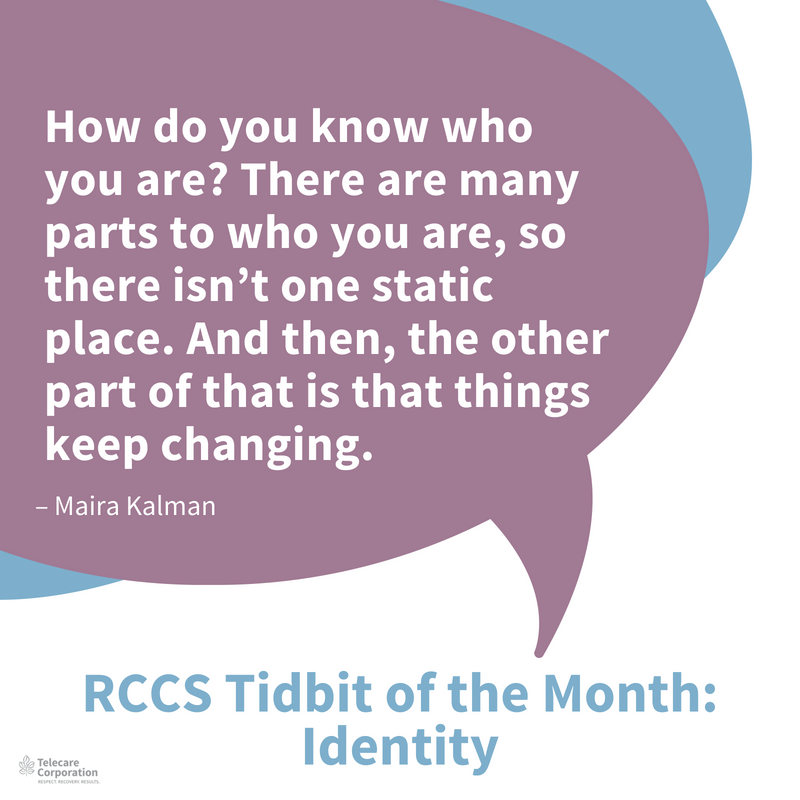 The RCCS Tidbit of the Month is part of Telecare's Recovery-Centered Clinical System curriculum to reinforce a culture of recovery in mental health service programs. For more information, click here. In Telecare's Recovery-Centered Clinical System (RCCS), we say we are all on a journey heading somewhere. For some of us, the path is clear. For others, it's not. In our national culture today, we’re constantly asked to think about who we are — and who we’re not. Whether it's through identity politics, immigration status, tribalism, racial bias, or privilege, the conversation about identity is growing bigger and, sadly, often more divisive. If we're not careful, our relationships and recovery culture can also get defined by labels of people (job titles, roles within the team, staff vs. managers). At Telecare, we strive to remind ourselves to remain curious and approach our relationships by seeking to understand each other, not from what we think we know, but rather from a more humble position of recognizing what we don't know. We call this cultural humility. to download a pdf version of the rccs tidbit of the month, Click here. The RCCS works from the perspective that each of us is uniquely different. This uniqueness encompasses an individual's lived experiences, and how they interpret the outside world. If we see and know others by being curious and open to other's values, beliefs, and worldview -- rather than building relationships based on assumptions -- our relationships become deeper and stronger. Judgment is reduced. And we can provide services that are respectful and culturally curious. The RCCS thus helps to counter the assumptions and stigma that permeate the dominant culture. We also know that who we are today may be, in some ways, different than who we were five years ago today. Who we are five years from now might be different than who we are today. The RCCS includes two conversations to help begin this exploration. The conversations are: 1) My Story, My Values, My Identity – Now, and 2) My Identity - The Future. These conversations can be used between staff and clients, as well as between staff and staff. They help people get to know each other and remain curious. They also help us to see and know each other, not as labels or as a member of a group, but as individuals with unique stories, gifts, and talents. Complete the My Identity - Now conversation tool. Be curious. Ask your partner questions about who they are. How might your identity be different five years from today?